If I am considering bankruptcy, do I need to take the pre-​​filing bankruptcy credit counseling course or the pre-​​discharge debtor education course? If yes, when do I need to take these classes? When do I need to take the debtor education post bank­ruptcy course? How long do I have to take it after filing for bankruptcy? Are Access Counseling Inc. (Access) and Financial Education Services (FES) approved providers of the required bankruptcy credit counseling and the personal financial management course? Are Access Counseling Inc. (Access) and Financial Education Services (FES) authorized by the Executive Office for the United States Trustees (EOUST) to issue certificates that satisfy the court requirements for personal bankruptcy? In what states are Access Counseling Inc. (Access) and Financial Education Services (FES) authorized by the Executive Office for the United States Trustees (EOUST) to issue certificates that satisfy the court requirements for personal bankruptcy? Where can I find a bankruptcy class? 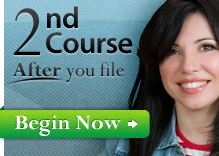 How are the bankruptcy counseling and debtor education courses offered? Is the information I submit through this web site secure? Do I need to meet with a bankruptcy attorney before I can speak to one of your counselors? Can joint bankruptcy filers take the pre-​​filing bankruptcy credit counseling and debtor education courses together? When and how do I receive my certificate of completion? Why do I have to take a debtor education course after I have already filed for bankruptcy? Can another person take the bankruptcy credit counseling or the debtor education course for me? Does my certificate of completion for bankruptcy credit counseling and the financial management course expire? Should I follow up with my bankruptcy attorney once my certificate of completion has been issued? What is a Debtor’s Cer­ti­fi­ca­tion of Com­ple­tion of Post-​​­pe­ti­tion Instruc­tional Course , or a Form B23 (Official Form 23)? Q: If I am considering bankruptcy, do I need to take the pre-​​filing bankruptcy credit counseling course or the pre-​​discharge debtor education course? If yes, when do I need to take these classes? A: Yes, these courses are required according to the Bankruptcy Abuse Prevention and Consumer Protection Act of 2005 (BAPCPA). 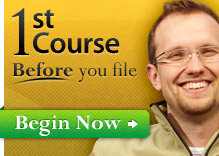 You should first take the pre-​​filing bankruptcy credit counseling course . The pre-​​filing bankruptcy credit counseling course is also known as a pre-​​petition counseling session or a budget briefing. You will be required to provide a certificate of completion showing you have completed the bankruptcy credit counseling course prior to filing for bankruptcy. After filing bankruptcy, and after receiving your bankruptcy identification number, you will then be required to take the pre-​​discharge debtor education course . The debtor education course is also known as the personal financial management course or the post-​​filing debtor education course, and completion of this course is required before your debts can be legally discharged through bankruptcy. Q: When do I need to take the debtor education post bank­ruptcy course? How long do I have to take it after filing for bankruptcy? A: In a chap­ter 7 case, you must take the debtor edu­ca­tion post-​​bankruptcy class (1) after you file your peti­tion for bank­ruptcy and (2) within 45 days after your first meet­ing date with your cred­i­tors and bank­ruptcy trustee. This meet­ing is also known as a 341 meet­ing (named after chap­ter 341 in the Bank­ruptcy Code which requires it). In a chap­ter 13 case, the debtor edu­ca­tion post-​​bankruptcy class must be taken (1) after you file your peti­tion for bank­ruptcy and (2) no later than the last pay­ment you have to make as required by your bank­ruptcy plan, or the fil­ing of a motion for entry of a dis­charge under chap­ter 1328(b) of the Bank­ruptcy Code. Q: Are Access Counseling Inc. (Access) and Financial Education Services (FES) approved providers of the required bankruptcy credit counseling and the personal financial management course? A: Yes, Access and FES have been approved to issue certificates evidencing completion of the pre-​​filing Credit Counseling and the pre-​​discharge debtor education course in compliance with the Bankruptcy Code. Approval does not endorse or assure the quality of a Provider’s services. Q: Access Counseling Inc. (Access) and Financial Education Services ( FES ) authorized by the Executive Office for the United States Trustees ( EOUST ) to issue certificates that satisfy the court requirements for personal bankruptcy? A: Yes. Both Access and FES have been approved by the Executive Office for the United States Trustees (EOUST). Q: In what states are Access Counseling Inc. (Access) and Financial Education Services ( FES ) authorized by the Executive Office for the United States Trustees ( EOUST ) to issue certificates that satisfy the court requirements for personal bankruptcy? Where can I find a bankruptcy class? A: Access Counseling Inc. is authorized to offer pre-​​filing bankruptcy classes and certificates in all the states except Alabama and North Carolina. Financial Education Services can offer the post-​​filing debtor education bankruptcy classes and certificates in these same states. Q: How are the bankruptcy counseling and debtor education courses offered? A: The bankruptcy counseling course is available by internet or by telephone. The debtor education course is available by internet only. Q: How much do the courses cost? A: We charge the same price for single, joint and married filers: the pre-filing bankruptcy credit counseling course is available online for only $25 and by telephone for only $25. The pre-discharge debtor education course is available online for only $25. If you are filing a joint bankruptcy, you will only be required to pay one fee to take each class. Access and FES may waive the bankruptcy pre-filing counseling fee and pre-discharge debtor education fee for consumers whose household income is equal to or less than 150 percent of the estimated poverty threshold for their applicable family size as published in the current Federal Poverty Levels Guidelines. Click here to read our Fee Waiver Policy. A: Payments are accepted online or over the phone. We accept debit cards, electronic withdrawals from checking accounts, and money orders. Q: Is the information I submit through this web site secure? A: The pre-​​filing bankruptcy credit counseling course takes a minimum of 60 minutes to complete. The pre-​​discharge debtor education course takes a minimum of 2 hours. Theses time requirements conform to the EOUST minimum program guidelines. Q: Do I need an attorney to file for bankruptcy? A: Over 93% of consumers choose to work with a bankruptcy attorney to file a personal bankruptcy. You can choose to file yourself with the assistance of a paralegal or legal document assistant or legal document preparer, also known as filing pro se. Filing pro se requires that you prepare your own bankruptcy documents, understand the US Bankruptcy Code, and present your case in court. If you choose to work with a bankruptcy attorney, he or she will usually attend the 341 (a) Meeting of the Creditors, negotiate with your creditors, advise you about offers to accept or reject, and give legal advice in general. A paralegal can fill out the necessary forms, but cannot represent you legally or give legal advice about how to fill out the forms, or what the law says about your particular situation. Q: Do I need to meet with a bankruptcy attorney before I can speak to one of your counselors? A: No, you can talk to a counselor by calling 1-(800)-BK-CLASS before or after you meet with a bankruptcy attorney. Q: Can joint bankruptcy filers take the pre-​​filing bankruptcy credit counseling and debtor education courses together? A: Yes, and there are no additional fees charged for taking the course together! A: You can begin the courses online by visiting our home page www.BKClass.com or by calling 1-(800)-BK-CLASS. Q: When and how do I receive my certificate of completion? A: After completing the online pre-​​petition credit counseling course you will be required to contact us to verify your identity and complete the certification process. The certificate will be sent immediately following this phone call, and can be delivered to you and your attorney by email, fax, or mail. After completing the online post-​​filing course, you will instantly be provided a certificate of completion, and can be delivered to you and your attorney by email, fax, or mail. Q: Who will receive the certificate of completion? A: The certificate(s) can be sent to you and your bankruptcy attorney by email, fax or mail. Q: Why do I have to take a debtor education course after I have already filed for bankruptcy? A: The Bankruptcy Abuse Prevention and Consumer Protection Act of 2005 includes two provisions mandating financial counseling and education: Before filing for bankruptcy, consumers are required to have a briefing on the alternatives to bankruptcy; and before receiving a bankruptcy discharge a debtor is required to complete an instructional course concerning personal financial management. These provisions were included to provide debtors in bankruptcy with the skills and tools needed to potentially avoid future financial problems. Q: Can another person take the bankruptcy credit counseling or the debtor education course for me? Q: Are there any tests? A: No. Each course is designed to help you understand your own personal financial picture. There are short quizzes in the course, however, you cannot fail! They are presented merely as a way to make sure that key information is delivered to you during each course. Q: Does my certificate of completion for bankruptcy credit counseling and the financial management course expire? A: Yes, the pre-​​filing bankruptcy credit counseling certificate expires 180 date from the date if is issued by Access. The pre-​​discharge debtor education certificate issued by FES is valid until your court ordered completion date for discharge. Your bankruptcy attorney may be able to provide additional clarification regarding these requirements. Q: Should I follow up with my bankruptcy attorney once my certificate of completion has been issued? A: Yes. Once the certification process has been completed, Access and FES will email, fax or mail a copy of the certificate to you and your attorney. It is your responsibility to follow up with your bankruptcy attorney to ensure that the certificate has been received. Access and FES can reissue the certificate at anytime at your request. Q: What is a Debtor’s Cer­ti­fi­ca­tion of Com­ple­tion of Post-​​­pe­ti­tion Instruc­tional Course, or a Form B23 (Official Form 23)? A: Form B23 , also known as Form 23 Debtor’s Cer­ti­fi­ca­tion of Com­ple­tion of Instruc­tional Course, is a form stat­ing that you cer­tify that you have com­pleted a course in per­sonal finan­cial man­age­ment. This Debtor’s Cer­ti­fi­ca­tion of Com­ple­tion must be filed with the Bank­ruptcy Court in accor­dance with fil­ing dead­lines required for Chap­ter 7 or Chap­ter 13.